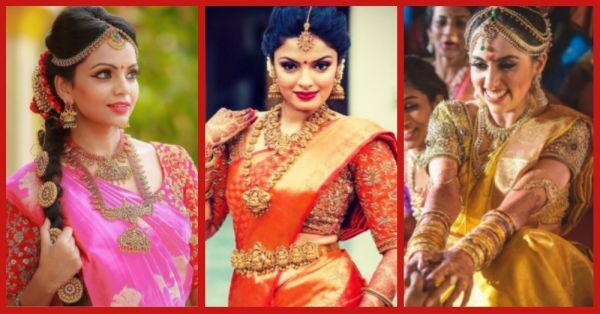 Brides Of South India: 6 Beautiful Brides To Inspire Your Style! Bold eyeliner, a long braid, pretty jhumkas, extravagant maathapattis, kanjeevaram sarees and so much elan! For those of you who couldn’t guess, we are talking about South Indian brides. Nothing spells out elegance better than a gorgeously decked up South Indian bride. So if you too are a bride from down South, here is some awesome fashion inspiration that you should definitely check out. 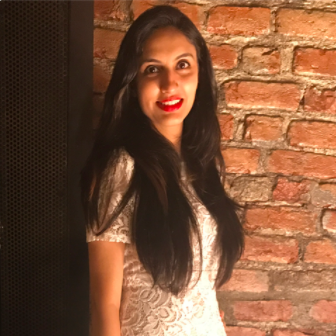 Now that POPxo is in six different languages, brides from different parts of India can find bridal beauty and fashion inspirations that are specific to their region and in their language. Excited?! What we love most about this bride’s look is the gorgeous pink and red combination, which is not just prominent in her outfit, but also in her jewellery and gajra. The colours suit the bride really well, and she is totally rocking her look! If you are someone who believes in the theory of ‘less is more’, then you must take inspiration from this gorgeous bride. The saree, the layered necklaces and even the makeup, everything looks so well put together and surreal. Also, do not miss the simple gajra which completes her gorgeous bridal look. The first thing we noticed about this picture is the sheer glow and pure bliss on the bride’s face. Her carefree laughter says it all, doesn’t it? But well, we also couldn’t miss her bright gold-toned yellow saree and her stunning jewellery. The layered mathapatti, bajuband and matching bangles are a pretty addition to her monotone look. Bringing you some serious inspiration for the mehendi outfit! Chiranjeevi’s daughter Sreeja wore this absolutely stunning layered lehenga for her mehendi ceremony last year. All the vibrant shades in her outfit merge well together and give out a very happy vibe, don’t you think? Also, her killer blue aviators add that #swag to her look, which we just love! The outfit was designed by designer Shravan Kummar. Silk is one fabric which can never go out of fashion. And, Sreeja looked stunning in a vintage banarasi silk weave in bright, vibrant colours. Dressed in a Shravan Kummar outfit for her haldi ceremony, she finished off her look with simple jewellery and the classic gajra. Now, now! We are totally in love with this gorgeous Malayali bride who went for the classic white saree with a gold border and an elegant red silk blouse. Her simple jewellery, especially that gorgeous mathapatti and the matching bangles, is what makes her look so charming.